Spot silver prices ended last week in positive territory following the sharp breakout in gold prices, which has led the industrial commodity higher as a result over the last two weeks, and the question now of course is whether this rally will continue in the short term, or will we see a pullback in due course. The answer to this question for silver traders lies in several different markets, and not least the prospect for gold prices in the short term, and the concern here is whether we are likely to see yet another failed attempt to break and hold above the $1000 per ounce level, or will this level become a key support area in due course. Technically the gold chart still looks strong, and should this level be cleared then this should provide sufficient momentum to pull silver prices higher as a result. However, silver has it’s own problems, as we are now probing ever deeper into the strong resistance level in the daily silver chart, between the $16.50 per ounce level and $18.50 per ounce level – a deep and significant area of resistance which cannot be ignored. Indeed Friday’s candle for spot silver hinted at a degree of bearishness, ending the silver trading session with a deep upper wick, outlining the failed attempt to push higher. 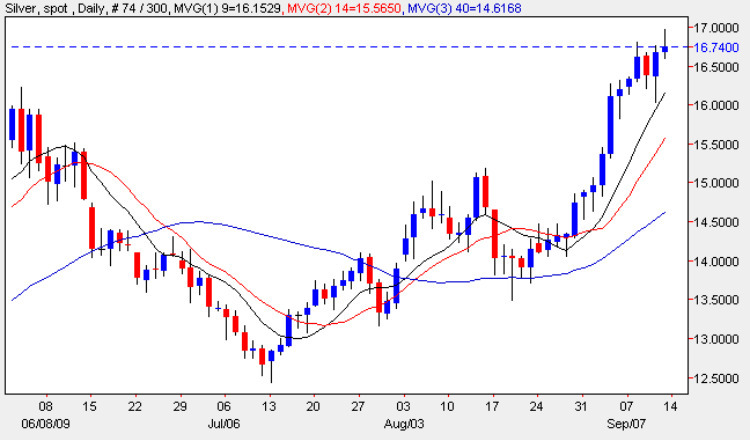 With all three moving averages pointing sharply higher the silver chart still remain bullish, however the resistance outlined above may well prove to be definitive in the short term outlook for silver prices – if it is breached in due course then this will open the way to silver trading higher towards the $19 per ounce region, but should it remain intact then we may see a deeper reversal lower back to re-test the support now in place in the $15.25 per ounce level.